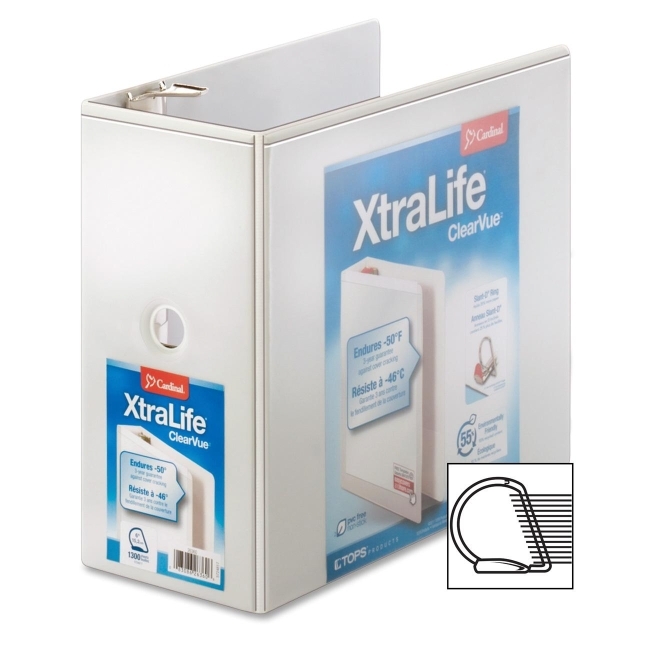 View binder features a unique XtraLife material that will not stick to cover title insert or materials stored inside, including photos, laser prints and photocopies. Material is much stronger than standard vinyl so no seam splitting and hinge tearing. Unique, PVC-free polyolefin cover material is better for the environment when produced and disposed than vinyl. Nonstick cover offers a clear, nonglare overlay on three-sides for easy customization. Designed to endure extreme temperatures, this binder is cold-crack tested to negative 50 degrees Fahrenheit. Locking Slant-D rings hold 25 percent more letter-size material than standard round rings while GelTab triggers make it comfortable to operate. Back-mounted steel rings provide a clean, professional spine and reduce wear. 6" ring capacity holds 1,300 sheets. Horizontal pockets on the inside front and back covers hold loose papers. Each pocket holds 40 sheets. Binder also features a sturdy chipboard core and exposed rivets.